L. Van asks: What happens if a cemetery owner loses their ownership of the land? What about when their land fills up and no new dead people can be put in to pay? How do they afford to keep it going? Cemeteries are just like any other business; they need to make money in order to stay open. However, unlike other businesses, cemeteries, particularly ones in heavily populated areas, can only operate for so long before they run out of their main product- usable space to put bodies in. The people who buy a burial plot generally purchase the land once and then never move out. So how do cemeteries keep from themselves going under and what happens when they run out of money? For starters, one option for extending the life of the cemetery is to use every square inch possible, even many former walkways. For instance, the Karrakatta Cemetery in Perth, Australia operates a renewal program that creates new burial plots in the narrow spaces between existing graves. For a cemetery that opened in 1899 and is otherwise full up, the renewal program has allowed Karrakatta Cemetery to stay in business. Without the program, cemetery management claims they would have had to stop accepting any new burials in 2004. Another practice used by cemeteries to increase the business’s lifespan is reusing burial plots. The practice works more like a lease on the burial plot as opposed to a purchase. This sort of thing is common in places like Germany, Australia, and New Zealand. Once the lease is up, the usual practice is to cremate any remains once the occupant has been evicted from their grave. Other cemeteries, such as those managed by The Church of England, use a “dig and deepen” strategy, creating multi-storied graveyards. Workers exhume the remains before reburying them at a greater depth in the same burial plot. This leaves room for another person to be buried above them. However, if the perpetual care fund runs out or if there was never one to begin with, and if the cemetery is full-up with no further way to generate enough revenue to keep the business open, the cemetery may ultimately go bankrupt or otherwise be closed down or abandoned. If the process of a foreclosure or a bankruptcy starts, the rest of the operations at the cemetery screech to a halt. So the maintenance of the grounds, the burial of individuals who prepaid for their plots, and other day-to-day goings on stop while the courts and banks work out what will happen next to the business and land. Families and friends of those who prepaid for their burial end up faced with a difficult decision. They can wait for the bankruptcy or foreclosure issue to be resolved, find and purchase a new burial plot elsewhere, or, if the courts allow it, hire someone with the machinery to dig the grave in the plot they already paid for. Care of loved ones’ graves also falls to them during that time. From here, what happens next varies widely on a case by case basis. In the case of a cemetery foreclosure or complete abandonment, sometimes the local municipality will simply take over control and management of the land. In other cases, the current owner of the cemetery which is no longer economically viable may seek permission from their local municipality to sell or repurpose the land for commercial or home use. As you might imagine, this is a dicey proposition and the rules governing the legality of this vary greatly from region to region. One place where it can be more of an issue than others is in the United States where burial plot rights are, somewhat uniquely, generally considered perpetual, including passing on to relatives of the deceased who have the right to visit and maintain the grave site of their loved one whenever they please and potentially for all time. If someone were to, for instance, buy the property and build a house or houses over the graveyard, that would potentially infringe upon that right. However, the courts may decide that the relatives had previously abandoned the particular grave or may otherwise decide to grant a sale or repurposing of the land anyway. For instance, it may be decided that it’s in the best interest of a given community to grant such permission, despite any objections from those who have loved ones buried in the cemetery in question. So, in the end, repurposing land that was once an active graveyard usually requires jumping over a lot of legal hurdles. To get approval, the municipality may require as a part of the sale or repurposing agreement that all the graves be moved to another suitable location first. However, if the graveyard has been fully abandoned by everyone, including all the descendants of those buried there, and is not considered a historic grave site, the courts may grant the right for the owner of the property to sell or use the property for other things, like as a subdivision, without needing to remove the bodies. In these cases, it generally falls to the relatives of the deceased to move the remains before construction starts, if they so choose. All that said, as you might imagine, particularly in cases where houses are being built over former cemeteries, the real estate investors purchasing the land may well simply pay to have the graves moved first, as leaving the bodies often significantly cuts down on the ultimate sale prices of the homes built on top of them. Nobody wants a poltergeist house. Well, except for maybe these guys. 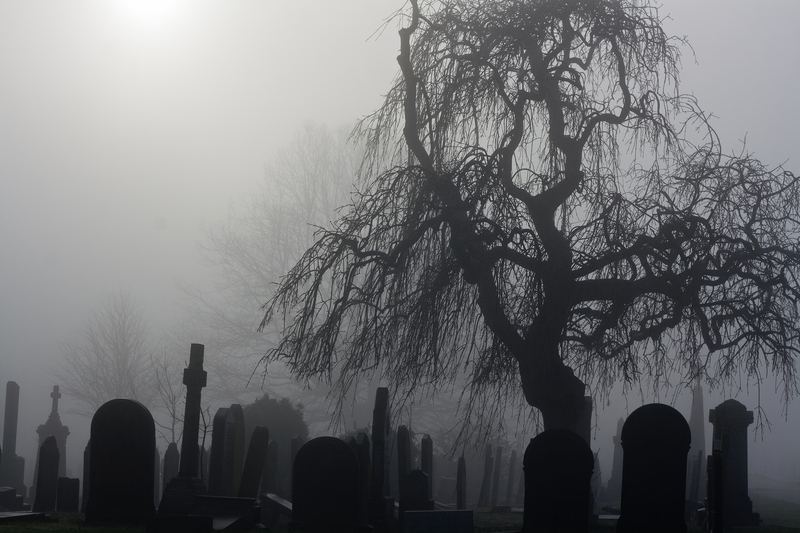 What happens when burial grounds fill up? Where could I be buried if graveyards run out of space? Bankrupt Cemetery: What’s Next for Deceased? What happens to a cemetery after foreclosure? It’s not common practice to evict bodies from graves in New Zealand. I’m not sure where you got that information from, but I’d like to know your source. A lot of graveyards in New Zealand are owned by municipal councils or churches who care for the land. @Alana Just search up “New Zealand reuse burial grounds” in Google and you’ll find sites and news articles backing that up. Damn straight. Maoris have respect for deceased which is far greater than many other cultures including western. How dare you make an uneducated comment like that about a culture. Aboriginals would never do this either as it’s their culture to not even see footage of a deceased person so to dig one up. You’re a moron an I don’t believe this article now cause that claim YOU made about MY people is such crap. Cemeteries are plain gross things… burn everyone and be done with it.